Atlantis Submarine Voyage takes riders on an adventure far below the surface of the ocean, diving in a submarine toward the lost city of Atlantis. On the way, guests encounter a variety of sharks, rays, fish and other sea creatures. 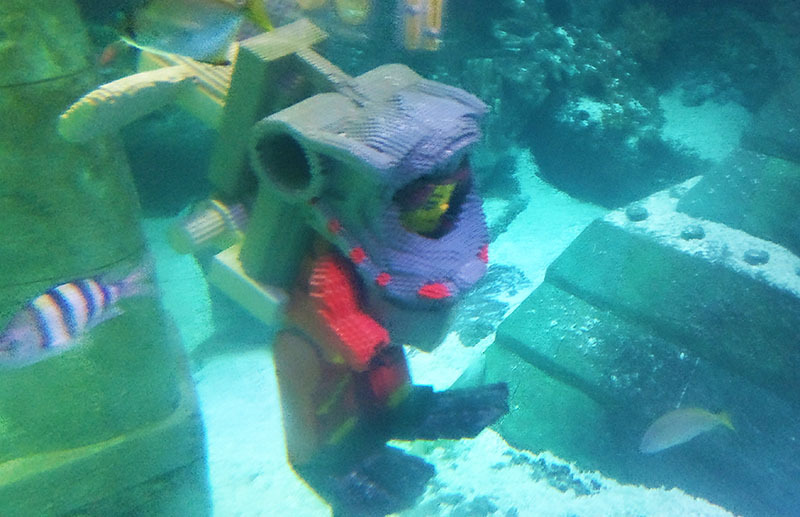 The ride was a world-first for Legoland Windsor when it opened in 2011, although it borrows heavily from Merlin’s successful Sea Life Centre brand. However, rather than having to walk around an aquarium peering into fish tanks, Atlantis Submarine Voyage places visitors right into the middle of the tank with fish swimming all around. Each submarine holds 14 people for the duration of the four minute journey. Special effects make it feel like the submarine dives under the water, but in reality only the bottom part of the ride vehicle in submerged at any time. The low down windows help with the illusion, but also can give adults a bit of a crick in the neck! The concept is very clever, and nicely executed. Atlantis is popular with guests too, and can attract long queues. Luckily, it is also a high capacity ride so can munch through people at quite a rate. Its proven success has meant that sister rides have been added to other Legoland parks across the world.